ABSTRACT. Small-scale coastal fisheries can cause detrimental impacts to non-target megafauna through bycatch. This can be particularly true when high-use areas for such species overlap with fishing grounds, as is the case with hawksbill turtle (Eretmochelys imbricata) aggregations at lobster gillnet fishing sites in El Salvador and Nicaragua. We quantified hawksbill bycatch by partnering with local fishers to record data for 690 gillnet sets on rocky reefs at Los Cobanos Reef Marine Protected Area (2008-2009) and Punta Amapala (2012-2014) in El Salvador, and La Salvia (2012-2014) in Nicaragua. Based on 31 observed hawksbill captures, the mean bycatch-per-unit-effort (0.0022; individuals per set = 0.0450) and mortality (0.74) are among the highest reported for the species across fishing gear types and oceanic regions worldwide, and we conservatively estimate that at least 227 juvenile hawksbill captures occurred in lobster gillnet fishing fleets at our sites during the study. Estimated mortality for the 227 hawksbills -which could approach the 74% observed mortality of total captures-from interactions with lobster gillnet fisheries at these sites during the study period may constitute the greatest single source of human-induced in-water mortality for juvenile, sub-adult, and adult hawksbills in the eastern Pacific, and is of grave concern to the population. Based on our findings, we discuss neritic habitat use by hawksbills during their 'lost years' and offer recommendations for bycatch reduction strategies, including community-based efforts to enhance sustainable self-governance via the establishment of locally crafted conservationist norms and marine protected areas at important developmental habitat. Keywords: bycatch rate, foraging hotspot, developmental biogeography, marine conservation, community-based governance, habitat protection. Unintentional capture of non-target species, or bycatch (Hall et al., 2000), constitutes a significant proportion of global catches in marine fisheries (Kelleher, 2005; Pauly & Zeller, 2016) and is considered a primary driver in population declines of many long-lived marine megafauna, including marine mammals, seabirds, elasmobranchs, and sea turtles (Zydelis et al., 2009; Mangel et al., 2010; Wallace et al., 2010, 2013; Dapp et al., 2013; Lewison et al., 2014; Peckham et al., 2016). For decades, research on bycatch taxa and mitigation efforts have focused on large-scale, industrial fisheries, given their high fishing effort and centralized infrastructure (Lewison et al., 2004; Soykan et al., 2008; Zydelis et al., 2009). Indeed, large-scale fisheries are recognized as a serious threat to some marine vertebrate populations that require urgent intervention. For example, pelagic longlining vessels in the North Pacific appear to be the largest known source of mortality for the black-footed albatross, killing at least 5,000-14,000 individuals annually, which represents the removal of 1.9-5.0% of the population per year (Lewison & Crowder, 2003). Similarly, pelagic longlines used by industrial fleets are a primary source of mortality for older, reproductively valuable leather-back turtles (Dermochelys coriacea) in the Pacific Ocean (Lewison et al., 2004; Donoso & Dutton, 2010), where fewer than 3,000 adult females nest in the entire oceanic basin (Benson et al., 2015). However, small-scale, artisanal fisheries also are coming under increasing scrutiny as important sources of bycatch across taxa commensurate with or surpassing levels found in large-scale fisheries (Zydelis et al., 2009; Alfaro-Shigueto et al., 2010b, 2011; Gilman et al., 2010; Peckham et al., 2016). Mangel et al. (2010), for instance, reported cetacean bycatch-per-unit-effort (BPUE) in Peruvian artisanal drift gillnet fisheries to be comparable to BPUE for the large-scale Moroccan driftnet fleet in the southwest Mediterranean. Additionally, Peckham et al. (2007) reported annual bycatch levels of ~1,000 loggerhead turtles (Caretta caretta) for two small-scale fleets in Baja California, Mexico, which is on par with bycatch levels incurred by the entire North Pacific large-scale fisheries. Small-scale, nearshore fisheries provide important livelihood support and poverty alleviation for coastal residents in low-income regions worldwide (Bene, 2006). At the same time, fishing pressure is among the most substantial of human impacts on coastal ecosystems (Stewart et al., 2010) and can result in a high frequency of interactions with marine vertebrates whose primary habitat commonly overlaps with small-scale fishing activities (Wallace et al., 2008; Lewison et al., 2014). Despite growing evidence of significant threats posed by small-scale fisheries, inherent logistical difficulties associated with monitoring and managing small-scale fleets (e.g., diffuse effort, decentralized infrastructure, political and economic marginalization, little regulation) result in few available data from which to base interventions (Chuenpagdee et al., 2006). There is an urgent need to fill these data gaps, as even relatively small fisheries with few fatal interactions could constitute a major threat to severely depleted populations of marine vertebrates. Similar to other long-lived marine megafauna, sea turtles exhibit life history characteristics -including slow maturation, low fecundity, and high adult survivorship- such that relatively low levels of bycatch mortality can hamper population viability (Heppell, 1998; Soykan et al., 2008; Wallace et al., 2008). This is particularly true for small populations of highly threatened species that are inherently susceptible to decline from mortality, such as hawksbill turtles (Eretmochelys imbricata) in the eastern Pacific Ocean. Hawksbills are critically endangered globally (Mortimer & Donnelly, 2008) and in the eastern Pacific Ocean are considered among the most endangered sea turtle populations in the world (Wallace et al., 2011). Fewer than 700 adult female hawksbills are estimated to exist in the eastern Pacific region (Mexico-Peru), with >90% of all known nesting activity occurring in El Salvador and Nicaragua (Gaos et al., 2010, 2017; Liles et al., 2015b). Contrary to their conspecifics in other oceanic regions that utilize long-distance (>2,000 km), offshore migrations (e.g., Miller et al., 1998; Van Dam et al., 2008), eastern Pacific hawksbills employ short (<300 km), nearshore (<4.2 km) migrations between nesting and foraging areas (Gaos et al., 2012a). The unique and highly neritic life history of hawksbills in the eastern Pacific may make them particularly vulnerable to nearshore in-water threats. Indeed, fisheries bycatch is considered a serious threat to eastern Pacific hawksbills (Gaos et al., 2010), including artisanal lobster gillnets on rocky reefs at Los Cobanos Reef Marine Protected Area (Los Cobanos) in El Salvador (Liles et al., 2011). Little is known, however, about the spatiotemporal distribution and bycatch rates at Los Cobanos and similar rocky reef systems at Punta Amapala in El Salvador and La Salvia in Nicaragua, where previous research signaled hawksbill bycatch occurs in lobster gillnet fisheries (Liles & Thomas, 2010; Gaos et al., 2014b). Further, eastern Pacific hawksbills are considered a high risk Regional Management Unit (RMU; Wallace et al., 2011) with high vulnerability to bycatch mortality and, therefore, a top priority for bycatch monitoring and mitigation, particularly in small-scale fisheries operating in or near critical hawksbill habitats (Wallace et al., 2010, 2013), such as at rocky reefs where eastern Pacific hawksbills congregate (Gaos et al., 2012a; Carrion-Cortez et al., 2013; Tóbon-Lopez & Amorocho-Llanos, 2014). For these reasons, we investigated the distribution and magnitude of hawksbill bycatch in artisanal lobster gillnet fisheries on rocky reefs along the Pacific coast of Central America to provide a better understanding of threats confronting the species in the region. Specifically, we quantified hawksbill bycatch and mortality, and examined spatiotemporal, environmental, and gillnet fishing predictor variables to help explain the incidental capture of hawksbills in lobster gillnet fisheries at Los Cobanos and Punta Amapala in El Salvador, and La Salvia in Nicaragua. Based on our findings, we discuss the potential population-level impacts of lobster gillnet bycatch on eastern Pacific hawksbills and offer insight into the developmental biogeography of this species in the region. We conclude by considering potential community-based conservation strategies to mitigate hawksbill bycatch in lobster gillnet fisheries along the Pacific coast of Central America. Previous studies identified lobster gillnet fishing as potentially interacting with hawksbills at Los Cébanos and Punta Amapala in El Salvador, Isla Amapala in Honduras, and La Salvia in Nicaragua (details for how and where these interview data were collected are available at Liles & Thomas, 2010 and Gaos et al., 2014b). We included all of these sites in the present study, except for Isla Amapala, which we excluded because of logistical constraints. Los Cébanos (13°31'N, 89°48'W), Punta Amapala (13°08'N, 87°55'W), and La Salvia (13°00'N, 87°39'W) (Fig. 1) are comprised primarily of submerged volcanic reef formations at depths ranging from 0 to 30 m and host diverse marine communities, including corals, sponges, and fishes (Orellana-Amador, 1985; Domínguez-Miranda, 2010). These rocky reef systems are under increasing pressure from local fishers, sedimentation loads transported by surrounding rivers, and wastewater discharge from nearby communities (Reyes-Bonilla & Barraza, 2003). Los Cébanos and Punta Amapala also constitute some of the most important open-coast nesting beaches for hawksbills in the eastern Pacific (Liles et al., 2011; Gaos et al., 2017), and all three sites are situated in the migration corridor of post-nesting hawksbills (Gaos et al., 2012a), increasing the potential for fisheries interactions. Punta Amapala and La Salvia flank the western and eastern sides of the Gulf of Fonseca, respectively (Cortés, 2007), which also is critical hawksbill foraging habitat (Gaos et al., 2012b). marine protected area at Poza de la Gata, Punta Amapala. Onboard observations of lobster gillnet fisheries occurred from 8 November 2008 to 29 September 2009 at Los Cébanos, 21 November 2012 to 29 April 2014 at Punta Amapala, and 11 September 2012 to 12 May 2014 at La Salvia. We selected lobster gillnet fishers (1, 4, and 4 crews at Los Cébanos, Punta Amapala, and La Salvia, respectively) who were willing to participate in the study and trained them as observers to collect data on each gillnet they set during fishing trips. These data included net characteristics (i.e., length, height, mesh size, and line test), georeferenced location using a handheld GPS unit, substrate type, depth, weight of lobster catch, and number of hawksbill bycatch events. While we have bycatch data for other species (e.g., olive ridley turtles (Lepidochelys olivacea)), this study was focused on describing bycatch of hawksbills at our study sites. 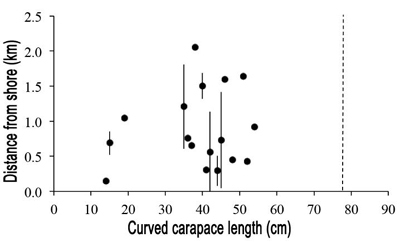 For each hawksbill capture, observers measured curved carapace length (CCL) from nuchal notch to posterior-most tip of marginal scutes, and spatially referenced the location of capture using a GPS unit. Observers tagged live turtles with inconel tags (Model 681, National Band & Tag, Newport, KY, USA) on the second proximal scale at the edge of both front flippers, photographed them for confirmation, and subsequently released the individuals. Dead turtles were measured, photographed, and buried. We used previously established diagnostic approaches to determine whether a turtle was bycaught in fisheries (e.g., Caillouet Jr. et al., 1996; Koch et al., 2006). Specifically, we inferred the source of mortality for hawksbills found adrift or stranded to be lobster gillnets when the turtle exhibited at least two of the following characteristics: 1) carcass presented evidence of gillnet interactions, such as marks and/or lesions on extremities, 2) carcass encountered adjacent to (i.e., ≤2.0 km considering prevailing northward surface current) known lobster gillnet fishing sites, 3) size class of carcass corresponded to those that have been directly observed as bycatch in lobster gillnets at the study sites and 4) month carcass was found coincided with lobster gillnet fishing season (September-April) at the study sites. As compensation for collaboration, we covered fuel costs for fishing activities of the observers at Los Cobanos and provided fishing gear (e.g., life jackets, rain gear, handheld GPS units) to observers at Punta Amapala and La Salvia. Local fishers typically worked in 2-3 person crews from 6-8 m skiffs powered with 40 horsepower outboard motors and used bottom-set gillnets to target primarily Pacific green spiny lobster (Panulirus gracilis), which have high commercial value on local markets, but also retained incidentally captured species (families Carangidae, Haemulidae, Kyphosidae, Portu-nidae, Scombridae, and Serranidae) of lesser commercial value for sale or subsistence. Gillnets measured 600-4,000 m in length by 1 m in height with 7.6-12.7 cm mesh monofilament mesh and 1.4-13.6 kg line test, and were soaked 1-31 h at depths of 1-43 m (Table 1). All gillnets were anchored to the bottom using rocks, cement-filled plastic bottles, or anchors at both ends, with lead weights attached along the foot-rope. At Los Cobanos and Punta Amapala, local fishers used gillnets with small floats along the head-rope that produced an inverse pendulum effect, where the head-rope suspended <1 m above the foot-rope anchored to the substrate and swung back and forth with the current. At La Salvia, gillnets were fished without floats along the head-rope, where the net laid across the bottom and entangled in marine invertebrates (e.g., sponges and corals) and substrate. At Los Cobanos and La Salvia, local fishers typically set nets in the afternoon and retrieved them the following morning, whereas at Punta Amapala, nets were set in the morning and retrieved the following morning. Given the dynamic nature of many small-scale fishing fleets (Bene, 2006) and the complications associated with managing fishers that use informal landing sites in small communities (Salas et al., 2007), accurate country-wide estimates for the entire artisanal lobster gillnet fishing fleets in El Salvador and Nicaragua are unavailable. However, the lobster gillnet fishing fleet numbered approximately 14 boats (28 to 42 fishers) at Los Cobanos in 2008-2009, with the communities of Los Cobanos, Barra Ciega, and Barra Salada contributing five, two, and seven boats, respectively (W. Lopez, pers. obs.). Based on surveys conducted with lobster fishers at Punta Amapala and La Salvia in 2015 (C. Pacheco, pers. obs. ), the fleet at Punta Amapala consisted of an estimated 53 boats (103 fishers) in 2012-2014, 50 of which departed from the community of Playas Negras and three from El Maculis, and at La Salvia in 2012-2014, nine boats (20 fishers) operated out of the community of La Salvia. Fishing effort and frequency of fishing trips at the three sites depended on lobster catches. During the primary lobster fishing season (September-April), boats set gillnets 4-7 days per week during periods of high lobster catches and 2-3 days per week during periods of low catches (CENDEPESCA, 2012). During the offseason, boats generally fished 0-2 days per week, but would increase frequency if lobster catches were high. We calculated hawksbill BPUE for each net as the number of hawksbill captures per gillnet fishing effort ([net length 100 m-1] x [net soak time 12 h-1]) (Wang et al., 2013) and hawksbill mortality as the proportion of hawksbills killed. Additionally, to facilitate comparisons with other published data, we reported hawksbill bycatch per gillnet set (Wallace et al., 2010). However, we used the BPUE calculation that incorporated net length and soaktime for higher resolution in fishing effort for all estimates. To estimate the minimum annual hawksbill bycatch across the lobster gillnet fishing fleet at each site, we made two calculations and then reported the lower value: 1) multiplied the mean hawksbill BPUE for each net per boat per day by the estimated fishing effort (minimum observed gillnet fishing effort among boats that fished per day) for the estimated minimum number of boats fishing during a given year, and 2) multiplied the average number of observed hawksbill bycatch events per boat by the estimated minimum number of boats fishing during a given year (see Fisheries observations subsection for the estimated number of boats per study site; Table 3). 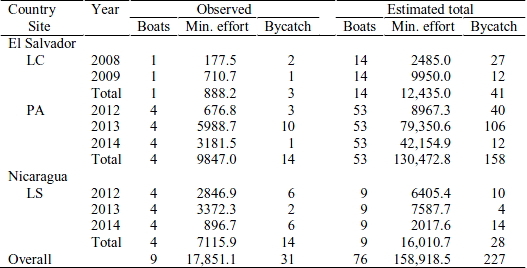 We formulated competing nominal logistic regression models using each of 13 spatio-temporal, environmental, and gillnet fishing variables (Table 1) singly, in pairs, collectively, and with interactions to explain hawksbill bycatch in observed lobster gillnet sets. Models were then compared within an information-theoretic approach to model selection using Akaike's information criterion corrected for small sample size (AICc), and calculating the associated Akaike weights (wi) for each model (Burnham & Anderson, 2002). We evaluated model performance by calculating the area-under-the-curve (AUC) of the receiver operating characteristics (ROC) plot (Field & Bell, 1997), and considered AUC values of 0.5-0.7, 0.7-0.8, 0.8-0.9, and >0.9 as poor, acceptable, excellent, and outstanding agreement between predictions and observations, respectively (Swets, 1988; Hosmer & Lemeshow, 2000). We computed all statistical analyses and spatial analyses using JMP Pro 12.2 (SAS Institute, Cary, NC, USA) and ArcMap 10.4 (Esri, Redlands, CA, USA), respectively. For descriptive statistics, values are presented as mean ± standard deviation (SD). Observers monitored 690 gillnet sets (total observed fishing effort = 20,018.5 effort units (see Data analyses subsection for formula)) in lobster gillnet fisheries at Los Cobanos (n = 133 sets), Punta Amapala (n = 300 sets) and La Salvia (n = 257 sets) (Fig. 1). Most observed fishing effort occurred from September to April (86.5% of total, n = 17,312.5 effort units), which coincides with the lobster fishing season at the three sites, and nearly 50% (n = 319) of total observed gillnet sets occurred in 2013, which was the only full year monitored. The mean net length and soaktime per observed set across sites was 1,926.0 ± 1,014.5 m and 17.5 ± 5.3 h, respectively, with the longest nets deployed at La Salvia (mean = 2,330.1 ± 526.6 m) and longest soaktimes at Punta Amapala (21.3 ± 2.1 h, Table 2). Gillnet sets occurred primarily on rocky substrate (91.4%, n = 631 sets) and the mean depth of observed gillnets across sites was 10.6 ± 6.0 m (n = 686 sets), with nets set shallowest (2.7 ± 0.9 m, range = 1.56.0, n = 133 sets) and deepest (14.8 ± 5.2 m, range = 3.5-42.6, n = 299 sets) at Los Cébanos and Punta Amapala, respectively. The mean distance of nets from shore was likewise closest (0.52 ± 0.3 km, range = 0.101.30, n = 133 sets) at Los Cébanos and furthest (1.68 ± 0.5 km, range = 0.39-3.93, n = 300 sets) at Punta Amapala, with an average distance of 1.33 ± 0.8 km (n = 690 sets) at the three sites. found adrift or on beach likely killed by lobster gillnets; CCL, curved carapace length. incidentally captured in lobster gillnets not included in size values. Hawksbill capture in observed gillnet sets was a relatively rare event -662 sets (96.0% of total) captured no hawksbills, 25 sets (3.6%) captured one hawksbill, and three sets captured two hawksbills (0.4%). 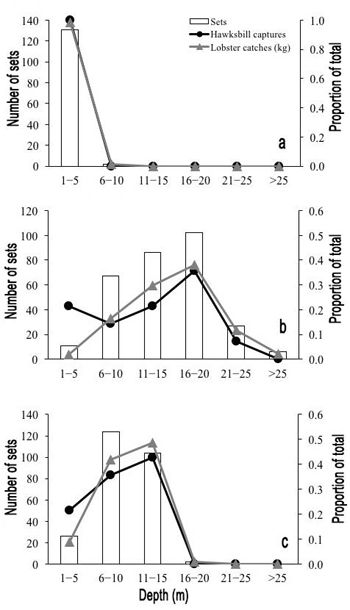 Combined, the 690 observed gillnet sets captured 31 hawksbills (BPUE = 0.0022), of which 90.3% (n = 28) occurred at Punta Amapala (n = 14 hawksbills, BPUE = 0.0016) and La Salvia (n = 14 hawksbills, BPUE = 0.0024; Table 2). Despite fewer hawksbill captures (n = 3), observed gillnet sets at Los Cébanos registered the highest BPUE (0.0032) of the three sites. Hawksbill capture per gillnet set was 0.0450 across sites, with values of 0.0226, 0.0467, and 0.0545 registered at Los Cébanos, Punta Amapala, and La Salvia, respectively. Overall, hawksbill bycatch events were highest in December-January (n = 18) and September-October (n = 9), representing 69.2% of total hawksbill captures, and lowest in May and July-August with zero hawksbill captures, which reflected fishing effort and lobster catches (Fig. 2). 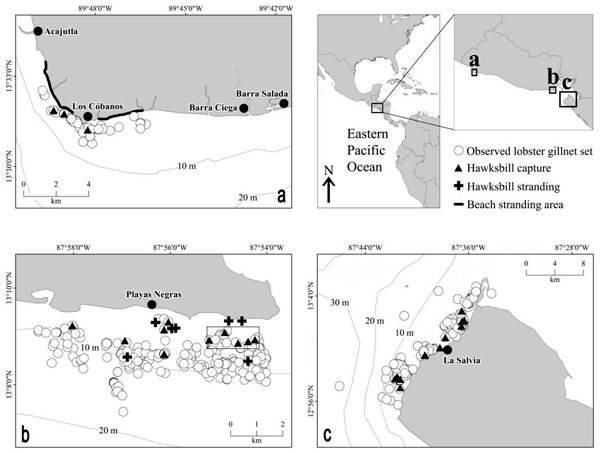 The mean depth and distance from shore of observed hawksbill captures across sites was 9.7 ± 5.3 m and 0.84 ± 0.6 km, respectively, with bycatch events shallowest (2.2 ± 0.8 m, range = 1.5-3.0, n = 3) and closest to shore (0.39 ± 0.1 km, range = 0.300.45) at Los Cébanos, and deepest (12.4 ± 5.7 m, range = 3.5-21.0, n = 14) and furthest from shore (0.98 ± 0.4 km, range = 0.45-1.64) at Punta Amapala. Hawksbill captures at Punta Amapala and La Salvia followed a pattern similar to the frequency of gillnet sets and lobster catches with respect to depth, except at shallow depths of 1-5 m, where the proportion of hawksbill captures was considerably higher than both net sets and lobster catches (Fig. 3). captures and lobster catches are expressed as proportion of total. (n = 256 sets, 14 hawksbills, and 2,822.7 kg of lobster). Of the 31 hawksbill captures, 74.2% (n = 23) were landed dead, with 100% mortality (n = 14) at Punta Amapala (Table 2). An additional 16 hawksbill carcasses were opportunistically found adrift or stranded on adjacent beaches during the study period, with eight, seven, and one dead hawksbills encountered at Los Cébanos, Punta Amapala, and La Salvia, respectively. Pooling observed hawksbill bycatch and stranding events across sites, 44.7% (n = 21) of total hawksbill-gillnet interactions and 67.7% (n = 21) of total observed mortality occurred at Punta Amapala. Measured hawksbills retrieved from gillnets and found stranded averaged 35.1 ± 12.1 cm CCL (range = 14-54, n = 34) at the three sites, with smaller (31.6 ± 14.7 cm CCL, n = 20) and larger (47.0 ± 5.6 cm CCL, n = 3) turtles at Punta Amapala and Los Cobanos, respectively (Table 2). We estimate that a minimum of 227 hawksbills were captured in the lobster gillnet fisheries at Los Cobanos (2008-2009), Punta Amapala (2012-2014), and La Salvia (2012-2014). The majority of these estimated bycatch events (69.7%, n =158 turtles) occurred at Punta Amapala, with >100 hawksbills captures occurring in 2013 (Table 3). Amapala (PA, 2012-2014), El Salvador, and La Salvia (LS, 2012-2014), Nicaragua. The best-approximating model for predicting hawksbill capture in observed lobster gillnet sets included four of the 13 predictor variables (wi = 0.126), which had <2 times the empirical support as the second-through fourth-ranked models (Table 4). The top 23 models constituted the 90% confidence set and were plausible, with a cumulative ΔAICc <7 (Burnham et al., 2011). Diverse combinations of the same variables in the models demonstrated their similarity in how they affect the system. 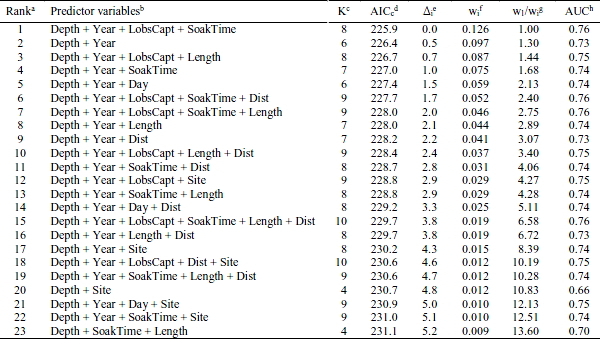 Depth and year were the most strongly supported predictor variables and appeared in 23 and 21 of the 23 best-approximating models, respectively, followed by soaktime (10 models) and distance from shore (9 models). AUC values for 22 of the top 23 models ranged from 0.70 to 0.76, indicating acceptable model performance, with only one model (0.66) considered poor. Low hawksbill abundance and relative rarity of bycatch events at our study sites often resulted in the disparity in hawksbill bycatch rates in similar spatiotemporal and biophysical conditions. Nevertheless, many of the top models had sufficient empirical support and acceptable AUC values, indicating that the variables included in the models are indeed important. Nicaragua (n = 678 sets). aModel ranked 1 is the best-approximating model according to AICc among those considered. Models ranked 1-23 constitute the 90% confidence set based on summed wi. hours the net was soaked in water, Year: year in which net was set (2008-2009; 2012-2014). cNumber of parameters in model. dAkaike's information criterion corrected for small sample size. eDelta AICc, difference in AICc value from best-approximating model. gEvidence ratio, relative likelihood of each model in relation to best-approximating model. There is growing concern that small-scale fisheries are driving declines in some sea turtle populations around the world (Soykan et al., 2008; Alfaro-Shigueto et al., 2010b; Moore et al., 2010). However, the paucity of bycatch data from small-scale fisheries globally continues to impede conservation interventions, particularly for hawksbills in the eastern Pacific (Wallace et al., 2010). Our study provides the first assessment of the spatiotemporal distribution patterns and magnitude of hawksbill bycatch and mortality in artisanal lobster gillnet fisheries in El Salvador and Nicaragua. Based on 31 observed hawksbill captures, of which 23 were lethal, we conservatively estimate that lobster gillnet fishing fleets captured at least 227 hawksbills on rocky reefs at Los Cobanos (2008-2009) and Punta Amapala (2012-2014) in El Salvador, and La Salvia (2012-2014) in Nicaragua. Estimated mortality for the 227 hawksbills -which could approach the 74% observed mortality of total captures- from interactions with lobster gillnet fisheries at these sites during the study period may constitute the greatest single source of human-induced in-water mortality for juvenile, sub-adult, and adult hawksbills in the eastern Pacific (Wallace et al, 2010, 2013). Although our observer data only encompassed a relatively small proportion of overall estimated lobster fishing fleets (7% at Los Cébanos, 8% at Punta Amapala, and 44% at La Salvia), we expect our calculations underestimate actual hawksbill bycatch at the three sites because 1) we used minimum values for all factors except hawksbill BPUE, for which we used observed BPUE, 2) we used minimum values for calculations from fisheries observations covering only a portion of each year, except for 2013, 3) the number of boats we used to calculate annual hawksbill bycatch was a conservative estimate, as there were likely additional boats operating at lobster fishing sites (e.g., 32 boats at Acajutla in Los Cébanos, CENDEPESCA, 2012) that we were unable to confirm and thus were omitted from our calculation, and 4) boats with observers may deviate from conventional fishing practices to avoid turtle captures or may conceal interactions with hawksbills (Gilman et al., 2005, 2007). Assigning cause of mortality for marine animals, including sea turtles, found adrift or stranded on a beach is challenging given the diverse array of human and natural threats operating in dynamic aquatic environments (Hart et al., 2006). To minimize these inherent uncertainties, we incorporated multiple indicators to infer the cause of mortality for hawksbills at our study sites (see Fisheries observations subsection) and our observations suggest that hawksbill interaction with lobster gillnets is the most likely cause for hawksbills found dead-stranded in this study. Whereas all 16 turtles were found adjacent to (≤1.78 km to the north) lobster gillnet fishing grounds (Fig. 1) during the months of peak lobster fishing effort (September-January; Fig. 2) and pertained to smaller size classes that corresponded with those directly observed as bycatch in the lobster gillnet fishery (Table 2), only a small subset of these individuals had clear external lesions or net scars. The general absence of lesions on bycaught and stranded turtles in our study is consistent with other studies with more robust datasets (Peckham et al., 2008; Alfaro-Shigueto et al., 2011; Snape et al., 2013; Senko et al., 2014). Because hawksbills generally partition vertical habitat by size, where juvenile turtles tend to forage at shallower water habitats than adults (Blumenthal et al., 2009), it is not because the extension of rocky reefs at our study sites prevents access to nearshore waters where hawksbills congregate (Arauz, 1996). Characterizing bycatch patterns for sea turtles across large geographic regions is necessary to understand potential cumulative impacts to species and is essential to guide conservation actions that may ameliorate threats (Lewison et al., 2014). Following the grouping of bycatch data into three broad fishing gear categories (i.e., nets, longlines, and trawls) used by Wallace et al. (2010), which allows for comparisons of bycatch in uncommon or underrepresented fisheries within and among regions, the mean BPUE (individuals per set; 0.0450) and mortality (0.74) we report for hawksbills in El Salvador and Nicaragua are among the highest reported for the species across fishing gears and oceanic regions worldwide, including net (e.g., western Atlantic, median BPUE = 0.008, median mortality = 0.50; eastern Pacific, 0.005, 0.39), longline (e.g., eastern Pacific, 0.118, 0.00; southwestern Indian, 0.034, 0.16), and trawl (northwestern Indian, 0.024, not determined; eastern Pacific, 0.011, 0.63) fisheries (Wallace et al., 2013). More recent studies on hawksbill bycatch support this assertion. Huang (2015) reported that two Taiwanese pelagic longline fishing fleets targeting tuna set 24,346,000 hooks and incidentally captured 156 hawksbills (0.0002 turtles per 1,000 hooks, 33.3% mortality) in the Pacific from 2008 to 2013. Based on commercial logbook records, Riskas et al. (2016) reported six hawksbill captures in pelagic gillnet fisheries near key foraging and nesting grounds off the coast of Australia in the western Pacific between 2000 and 2013, which comprised 3.1% of all reported surprising that lobster gillnet fisheries operating in shallow waters at our study sites captured turtles of smaller size classes when fishing activities and hawksbill foraging habitat overlapped. Further, eastern Pacific hawksbills are highly neritic and their movements typically occur <2 km from shore (Gaos et al., 2012a), making interactions with artisanal longlines and gillnets targeting pelagic fish species highly unlikely (e.g., De Paz & Sui, 2008). This is corroborated by informal interviews conducted with local fishers regarding hawksbill capture in these fisheries (A. Gaos, pers. obs.). Similarly, bycatch of juvenile hawksbills in industrial shrimp trawlers is improbable sea turtle interactions. In the southeastern Pacific, Ortiz et al. (2016) found a relatively high bycatch rate of 0.026 hawksbills per set (n = 6 turtles) in 228 bottom-set gillnets deployed from 11 boats using typical fishing practices as part of regular fishing trips during net illumination trials on the coast of Peru in 2011-2013. Given existing gaps in hawksbill bycatch data in some fisheries and oceanic regions, there are likely unreported or unstudied high-bycatch fisheries that may represent a serious threat to this species in other geographic areas. Regardless, known bycatch rates and mortality for hawksbills in the eastern Pacific -including our data on lobster gillnet fisheries- currently account for the highest or second highest rates across all three fishing gear categories in 13 oceanic regions (Wallace et al., 2013), underscoring the intense cumulative threat confronting the severely depleted population of hawksbills in the region. To mitigate sea turtle captures in fisheries effectively, conservationists need to understand spatiotemporal factors contributing to bycatch rates and mortality for species in diverse geographic areas. We identified several spatial patterns in the distribution of hawksbill captures and observed gillnet sets across the three sites. Overall, bycatch events tended to occur in gillnets deployed an average of 1 m shallower (9.7 m, range = 1.5-21.0) and nearly twice as close to shore (0.84 km, range = 0.14-2.05) than total gillnet sets (depth, 10.6 m, range = 1.0-42.6; distance, 1.33 km, range = 0.05-8.84; Fig. 1, 3-4). Model-selection supported this finding, with the predictor variables depth and distance from shore represented in 23 and 9 of the 23 best-approximating models, respectively (Table 4). Shallow depths of hawksbill captures on rocky reefs at our study sites dovetail with published data on the foraging ecology and dive behavior of the species. Hawksbills that forage at coral reefs primarily consume sponges and macroalgae, which are typically found at highest densities in shallow water (Meylan, 1988; Leon & Bjorndal, 2002; Bell, 2013), and rarely utilize habitats deeper than 20 m (Houghton et al., 2003; Witt et al., 2010). Similar to their conspecifics in other ocean regions, juvenile (Carrión-Cortez et al., 2013) and adult (Gaos et al., 2012c) hawksbills in the eastern Pacific predominately use shallow water habitat <20 m deep, where 92% (n = 18,389.4 effort units and 654 sets) of total fishing effort and 97% (n = 30) of total hawksbill captures occurred in our study, further highlighting the threat of lobster gillnet fishing activities operating in nearshore waters of El Salvador and Nicaragua. (2012-2014), El Salvador, and La Salvia (2012-2014), Nicaragua. carapace lengths listed in 1 cm increments. Temporal patterns in hawksbill bycatch at our study sites varied across months and years. 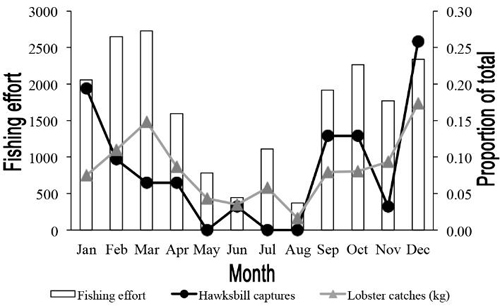 Hawksbill capture typically reflected the level of fishing effort, with higher bycatch occurring during the lobster-fishing season (September-April) and fewer bycatch events during the off-season (May-August) (Fig. 2). This is consistent with seasonal patterns of sea turtle bycatch corresponding to fishing effort reported elsewhere (Peckham et al., 2007; Gardner et al., 2008; Kot et al., 2009; Alfaro-Shigueto et al., 2011). Interannual variability in hawksbill bycatch often differed within and across sites (Table 2). For example, 43% (n = 6) of total hawksbill bycatch events occurred at La Salvia during a three-week period (21 December 2013-30 January 2014), when zero hawksbill captures occurred at the same site during the same period in 2012-2013. High interannual variability among sites was exemplified in 2014, where 7% (n = 1) and 43% (n = 6) of total hawksbill captures, constituting 30.3% (n = 3,281.3 effort units) and 10.8% (n = 896.7 effort units) of total fishing effort, occurred at Punta Amapala and La Salvia, respectively. The observed variability in bycatch patterns may be explained by underlying climatic and oceanographic conditions (e.g., El Niño Southern Oscillation) that structure productivity, prey, and predator distributions, and associated fishing effort (Kot et al., 2009). Given the potential variability in hawksbill bycatch among years, it is not surprising that all plausible models included year as an important predictor of hawksbill capture in lobster gillnet fisheries at our study sites (Table 4). Effective assessments of population-level effects of fisheries bycatch, including bycatch rates, mortality, reproductive values of affected individuals (i.e., relative importance of individual to current and future reproduction), and population characteristics (e.g., population abundance and trends, geographic distribution, life history traits of species), are imperative for identifying conservation priorities and recovery strategies for depleted sea turtle populations (Crouse et al., 1987; Wallace et al., 2008; Lewison et al., 2013). Even without accounting for potential sublethal effects of hawksbill captures, such as fitness and reproduction impairment (Wilson et al., 2014), or post-release mortality (Snoddy & Southwood-Williard, 2010), which could further exacerbate impacts to the population, the high observed bycatch rates and morality we report indicate that by themselves, lobster gillnet fisheries are a major threat to the persistence of hawksbills in the eastern Pacific. Our results underscore the threats that lobster gillnets can pose to non-target species, which is particularly troubling given their prevalent use in small-scale fisheries throughout Latin America. In the western Atlantic, artisanal fishers include nonselective gillnets in the wide array of main gear used to target lobsters in coastal waters, including traps, aggregation devices, and diving (Ehrhardt, 2005; FAO, 2006; Salas et al., 2011; Giraldes et al., 2015). Indeed, Aucoin & Leon (2007) reported the capture of three juvenile hawksbills in a 640 m lobster gillnet used in experimental bycatch trials during 24-h periods over four days in the Dominican Republic, and encountered a lobster gillnet with an additional seven dead juvenile hawksbills. In the eastern Pacific, small-scale fishers primarily use gillnets to capture lobsters (FAO, 2007; Perez-Gonzalez, 2011; Salas et al., 2011; Carrion-Cortez et al., 2013), although in Mexico, Colombia, and Ecuador lobster fishers also employ traps and diving (Beltran, 2005; Salas et al., 2011). We expect hawksbill bycatch to be greatest in lobster gillnet fisheries along the coast of Central America, where intense use of lobster gillnets occurs in areas relatively adjacent to major nesting grounds for this species in the region (Gaos et al., 2017), which employs short migrations between nesting and foraging areas (Gaos et al., 2012a). Size distributions of individuals captured at our study sites, corresponding to juveniles (Table 2, Fig. 4), demonstrate that rocky reefs in El Salvador and Nicaragua provide important developmental habitat for hawksbills in the region. Because sea turtle populations are sensitive to relatively small changes in survival rates of large juveniles (Crouse et al., 1987; Heppell et al., 2005; Wallace et al., 2008), the high frequency of interactions and mortality of juvenile hawksbills in lobster gillnet fisheries is particularly alarming given the extremely small size of the eastern Pacific population, and could undermine conservation gains from the protection of nesting sites (Gaos et al., 2017). We recognize that bycatch mortality of reproductively mature individuals constitutes a greater threat to sea turtle population viability than the loss of turtles from smaller size classes (e.g., Lewison & Crowder, 2007). However, the capture of at least 227juvenile hawksbills during our study from a severely depleted population consisting of fewer than 700 mature females is a cause for concern. While the absolute bycatch at our study sites appears to be relatively high for hawksbills (Wallace et al., 2013), it is comparatively lower than some other sea turtle species captured in net fisheries (Peckham et al., 2007). This disparity in absolute bycatch may reflect the relative abundance of species in a given ocean basin, where there can be a difference of orders of magnitude among populations and species (Donoso & Dutton, 2010). For example, absolute hawksbill bycatch from our study is overshadowed by numbers of hawksbills harvested for the tortoiseshell trade in the Indo-Pacific (Van Dijk & Shepherd, 2004) and by the number of green turtles (Chelonia mydas) consumed by humans at Baja California Sur, Mexico in the North Pacific (Senko et al., 2014), where hawksbills and green turtles are more abundant than eastern Pacific hawksbills (Seminoff, 2004; Mortimer & Donnelly, 2008). When combining our bycatch data of juveniles in lobster gillnet fisheries with those of other fisheries in the region, particularly juveniles killed in bottom-set gillnets in Mexico (Seminoff et al., 2003; Koch et al., 2006), Ecuador (Alava et al., 2005), and Peru (Alfaro-Shigueto et al., 2010a, 2010b; Ortiz et al., 2016), and juvenile and adult mortality in bottom-set longlines (M. Liles,pers. obs.) and blast fishing (Liles et al., 2011) in mangrove estuaries in El Salvador, hawksbill interactions with small-scale fisheries reportedly incur the largest cumulative impact to the species in the eastern Pacific and are of grave concern. Studies aimed at describing bycatch also can help elucidate cryptic life stages of species that occur in unknown or relatively inaccessible locations, such as the oceanic pelagic stage of post-hatchling and small juvenile sea turtles (Reich et al., 2007; Putman & Naro-Maciel, 2013; Van Houtan et al., 2016). Despite few available data, the existence of an oceanic pelagic stage during at least the first 1-2 years of a sea turtle's life, commonly referred to as the 'lost years' (Carr, 1986), is a life history hypothesis widely accepted for all sea turtle species, except the flatback (Natator depressus) in Australia (Carr, 1987; Musick & Limpus, 1997; Bolten, 2003; Reich et al., 2007; Witherington et al., 2012; Mansfield et al., 2014). However, because direct observations of post-hatchling and small juvenile sea turtles in developmental habitat are so rare, particularly for hawksbills, researchers often must infer a species' presence or absence from indirect findings (Putman et al., 2014). Van Houtan et al. (2016), for example, inferred from diverse indirect sources -including strandings, stomach contents, satellite drifters, and longline bycatch records- that hawksbills 0-4 years of age measuring 8-34 cm straight carapace length occurred predominantly in coastal pelagic waters of Hawaii and that absence of hawksbill bycatch in longlines may indicate a lack of prolonged presence in oceanic habitats in the North Pacific. Biases inherent in utilizing indirect approaches to determine presence of specific size classes of sea turtle species, such as demographic selectivity of fishing gear, targeted fishing areas, and population size, can increase uncertainty of findings but often are required when fisheries-independent approaches or direct observations are unavailable (Alfaro Shigueto et al., 2008). Direct observations of hawksbill captures at our study sites revealed that 11% (n = 3) and 19% (n = 5) of measured hawksbills (n = 27) had a mean carapace length of <15 cm and <20 cm, were captured at depths of 6.5 ± 4.0 m and 7.0 ± 3.7 m, and were located 0.51 ± 0.3 km and 0.69 ± 0.4 km from shore, respectively (Fig. 4). This is the first direct evidence that the 'lost years', or pelagic juvenile phase, for eastern Pacific hawksbills may be shorter than previously thought, or nonexistent, and questions whether hawksbills in this region conform to life-history patterns exhibited by other species and populations that undergo an ontogenetic shift from oceanic habitat to neritic habitat or whether an early oceanic-stage is entirely absent and recruitment to nearshore foraging areas occurs immediately after hatching. However, we recognize that our small sample size (n = 8 hawksbills) inhibits us from drawing firm conclusions and it is possible that these smaller turtles represent the smallest size class for new recruits, as some sea turtle species can partition size based on depth with smaller turtles occurring in shallower water (e.g., Koch et al., 2007). Regardless, our findings underscore the urgent need to mitigate in-water threats at rocky reefs utilized by all life stages of eastern Pacific hawksbills. Bycatch of long-lived marine megafauna in small-scale fisheries presents a formidable challenge and underscores the need for cross-sector collaboration to safeguard the distinct life stages of species across diverse habitats. Because many small-scale fisheries occur in low-income regions, depressed socioeconomic conditions can dictate the utilization of certain fishing practices (e.g., use of destructive fishing gear at coral reef ecosystems; Cinner, 2010). Bycatch reduction strategies that incorporate local fishers into decision-making processes could minimize threats to fishers' livelihoods and increase the long-term effectiveness of strategy implementation. In low-income regions where natural resource management and environmental law enforcement are typically weaker, primary resource users often self-govern resource use in their local environment (Dietz et al., 2003), such as lobster gillnet fishing in El Salvador and Nicaragua. This local reality highlights the power and control local fishers wield in determining the success or failure of hawksbill conservation initiatives (Liles et al., 2015a) and underscores the importance of understanding the factors that motivate or discourage their participation in conservation (Liles et al., 2016; Peterson & Liles, in press), especially as it relates to bycatch mitigation activities. Further, direct participation of local fishers that draws from their large repository of knowledge will be essential for identifying effective long-term solutions to bycatch. Such solutions must simultaneously maintain or increase target catches, if they are to be accepted among fishing communities (Gilman et al., 2005; Lewison et al., 2011; Peckham et al., 2016). Close collaboration with lobster gillnet fishers at our study sites offers important opportunities to assess potential lower-bycatch alternatives to lobster gillnets that have been successful in other regions, such as lobster traps (Shester & Micheli, 2011) and net illumination (Wang et al., 2013; Ortiz et al., 2016). Although these alternatives were not specifically tested in areas with operating lobster gillnet fisheries, they provide instructional opportunities for gear experimentation in areas where lobster gillnet fishing is prevalent, such as El Salvador and Nicaragua. Experimental lobster trap trials at Punta Amapala and La Salvia in 2013-2014 successfully eliminated hawksbill captures, but were ineffective at maintaining lobster yields (n = 0 kg total), regardless of bait types and spatiotemporal variation of sets (Gaos et al., 2014a), and preliminary net illumination trials at Punta Amapala in 2015-2016 have been inconclusive due to the absence of hawksbill captures in paired net trails (C. Pacheco, pers. obs. ), which might be confounded by environmental conditions at our study sites, such as high turbidity of water and strong currents. Despite discouraging results from initial bycatch reduction trials with traps and net illumination, spatiotemporal patterns in observed hawksbill bycatch and fishing effort during our study provide insight into potential community-based solutions to bycatch that could be tailored to local realities. At Punta Amapala and La Salvia, 21% (n = 6) of bycatch events occurred at depths of 1-5 m, while only 6% (n = 290.3 kg) and 7% (n = 37) of total lobster catches and gillnet sets occurred in the same range of depths, respectively (Fig. 3). Engaging local fishers to develop and adhere to shared conservationist norms that prohibit gillnet fishing in waters 1-5 m deep could drastically reduce hawksbill interactions across sites without substantially affecting lobster catches. Similarly, reducing soaktimes of nets (overall mean of 17.5 h) might reduce hawksbill bycatch and mortality from drowning, particularly at Punta Amapala where fishers soaked nets an average of 20.3 h with 100% hawksbill mortality, compared to nets set at Los Cébanos and La Salvia for 13.4 h with 0% mortality and 16.5 h with 64% mortality, respectively (Table 2). Model-selection supports this assertion, as soaktime was in 10 of the 23 best-supported models, including the top model, highlighting its importance in predicting hawksbill capture in lobster gillnets and the likely effectiveness of soaktime reduction (Table 4). However, local fishers often view maximizing fishing effort (i.e., long net lengths and soaktimes) as a way to reduce economic expenditures -longer soaktimes reduce trips to fishing sites resulting in lower costs attributed to transport- and therefore might be reluctant to adopt a practice perceived as an economic burden. However, conducting educational outreach via workshops with fishers that highlight the precarious conservation status of sea turtles, particularly hawksbills, and the low sustainability of bycatch, coupled with information on the proper handling of incidentally captured sea turtles (e.g., Sea Turtle Handling Guidebook for Fishermen; Gerosa & Aureggi, 2001), could help persuade fishers to modify their spatiotemporal fishing activities, reduce soak times, and enable them to reduce post-release mortality. In addition to potential spatiotemporal adjustments in fishing effort to mitigate bycatch, local fishers at Punta Amapala expressed interest in establishing a community-based protected area at Poza de la Gata (C. Pacheco, pers. obs. ), which is a portion of rocky reef where relatively high numbers of hawksbills forage and rest in shallow subtidal caves (Domínguez-Miranda, 2010), and where nearly 40% (n = 5) of hawksbill capture and mortality occurred with only marginal fishing effort (Fig. 1). MPAs and area closures that eliminate gillnet fishing can produce positive population responses of both non-target and target species within demarcated borders (Regular et al., 2013) and across a spillover-induced density gradient outside the borders of the protected area (Gell & Roberts, 2003; Goñi et al., 2006; Forcada et al., 2009). This is particularly true for coral and rocky reef ecosystems in low-income regions, where ubiquitous use of destructive fishing gears, such as gillnets, can degrade habitat and capture high proportions of immature individuals of target species ultimately leading to reduced yields (Cinner, 2010), which is currently observed in lobster gillnet fisheries at Los Cébanos and Punta Amapala (CENDEPESCA, 2012). Additionally, because high-maintained fishing effort can suppress biomass and alter the structure of target species populations (Campbell & Pardede, 2006), establishing communally-accepted no-take areas may relieve fishing pressure and create sustained nursery areas for lobster development, which could stimulate increases in biomass and restore the structural integrity of lobster populations across rocky reefs where overfishing occurs. However, local realities within which lobster fishers operate could challenge their ability to collectively manage resources effectively, including potential deficiencies in social cohesion and organization (Gutiérrez et al., 2011), disproportionate distributions of power and political influence in communities (Agrawal & Gibson, 1999), and lack of government support in regulating and sanctioning offenders (Liles et al., 2015a). Additionally, because gang- and drug-related crime is pervasive throughout El Salvador, which has situated the country among the most violent nations in the world (Carcach, 2015) and has impacted conservation at nesting beaches along the Salvadoran coast (Liles et al., 2011; Gaos et al., 2017), local fishers could be hesitant to engage in peer-pressure of nonconformists and rule enforcement due to fear of reprisals. Nonetheless, fisher interest in establishing a community-based protected area at Poza de la Gata to safeguard developmental areas of hawksbills and lobsters might surmount these impediments, which would represent the first protected area in El Salvador that was designed (e.g., delimit borders and devise rules) and managed (e.g., monitor congruence between established rules and fisher behavior) by local resource users, and could serve as a model for locally-driven conservation schemes at Los Cébanos and La Salvia, as well as other areas where effective management and enforcement of resource use are limited. For future natural science studies, we recommend that researchers continue partnering with local fishers to assess spatiotemporal patterns and demography of hawksbill bycatch in lobster gillnet fisheries along the Pacific coast of Central America, particularly at Los Cébanos and Isla Amapala in Honduras, over multiple years to better guide evidence-based bycatch reduction efforts and provide more accurate estimates of cumulative impacts to the population. Additionally, future research should quantify the amount and composition of non-hawksbill bycatch in lobster gillnet fisheries to evaluate potential impacts to marine invertebrates and benthic habitats, which would facilitate the development of ecosystem-based management strategies at rocky reefs. Finally, we suggest future studies focus on elucidating habitat use by post-hatchling and early juvenile hawksbills in the eastern Pacific, particularly at inshore mangrove estuaries in El Salvador and Nicaragua where >80% of nesting activity occurs (Gaos et al., 2017), to inform protection measures at critical developmental habitats in the region and to determine the existence of a pelagic juvenile phase for this population. Future social science research should assess the socioeconomic, political, and cultural characteristics of lobster fishing communities to better understand their adaptive capacity in collectively responding to resource fluctuations and ability to diversify livelihood strategies. We also suggest that research focus on how lobster fishers view their fishing practice and associated bycatch, what motivates their participation in lobster gillnet fishing, and what interpersonal connections facilitate or impede their activities in El Salvador in Nicaragua, to help identify locally relevant alternatives to damaging fishing practices that aim to reduce hawksbill mortality and negative impacts on rocky reef ecosystems. Unlike other areas of the eastern Pacific where opportunistic direct take of in-water hawksbills is prevalent (e.g., Baja California Peninsula, Mexico; Seminoff et al., 2003; Koch et al., 2006; Peckham et al., 2008; Peru; Alfaro-Shigueto et al., 2011), this practice is relatively rare along the Pacific coast of El Salvador and Nicaragua. Indirect take of hawksbills through fisheries bycatch, however, is common and threatens the species in nearshore, developmental habitat. Our findings demonstrate that lobster gillnet fisheries constitute a major source of mortality that likely has seriously negative impacts on the severely depleted eastern Pacific hawksbill population and support the growing body of literature that highlights small-scale fisheries as a key threat to the recovery of some sea turtle populations. Spatiotemporal patterns in fishing effort and bycatch observed in our study -including greater likelihood of hawksbill capture in nets set at shallow depths with longer soaktimes during the peak lobster fishing season- offer guidance for potential community-based mitigation strategies in lobster gillnet fisheries in El Salvador and Nicaragua. Limited capacity of many Central American governments to enforce environmental laws that protect endangered species elevates the role local fishers play in self-governing resource use and underscores the importance of partnering with local fishers to effectively conserve and recover hawksbills in the eastern Pacific. We thank local fishers at Los Cébanos, Punta Amapala, and La Salvia for their trust and collaboration, this study would have been impossible without their knowledge and participation. We acknowledge A. Gutiérrez, C. Dueñas, E. Lépez, G. Mariona and M. Vásquez for assistance. Constructive comments on earlier drafts from J. Mangel, J. Senko, and one anonymous reviewer were greatly appreciated. We are grateful to national environmental authorities in El Salvador (MARN) and Nicaragua (MARENA) for permits. We thank the Disney Worldwide Conservation Fund, Sungevity, U.S. Agency for International Development, U.S. National Fish and Wildlife Foundation, U.S. National Oceanic and Atmospheric Administration, and The Ocean Foundation for funding or logistical support. Gaos, A.R., M.J. Liles & J. Urteaga. 2014b. Eastern Pacific hawksbill initiative: phase III. Final Programmatic Report. San Diego, 10 pp. [http://www.hawksbill.org/wp-content/uploads/2010/2009/Gaos-et-al.-2014_Final-Programmatic-Report_ICAPO_2011-0037-2000.pdf] [ Links ].